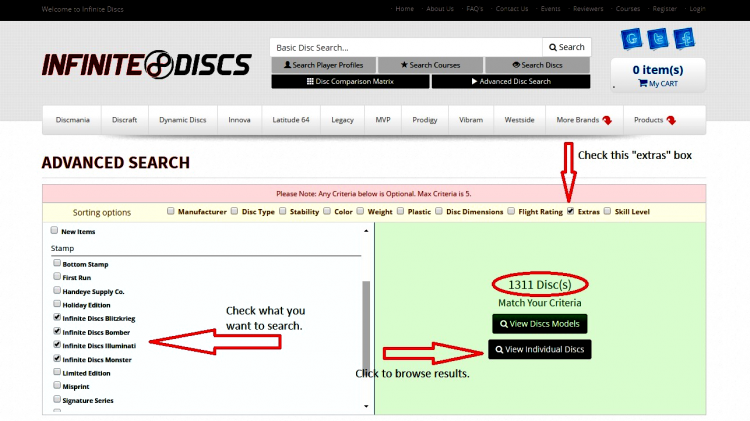 Step 1 – Click on the Advanced Disc Search button on the top of the page. Step 2 – Click on the little box next to “Extras” so it is checked. Step 3 – Use the resulting drop-down menu to check-mark the particular stamps or editions you are seeking. Step 4 – Click the button to View Individual Discs and browse the results. You can search several editions at a time. For example, you could select “Infinite Discs Bomber” as well as “Infinite Discs Monster” and see all the discs with those two particular stamps. Also note that if you click the “View Disc Models” button, it will show you disc models that have those stamps available, but it will NOT show those individual stamped discs. For example, it may show a regular Innova Destroyer, but you won’t see the stamp you’re looking for unless you were to browse through all the Destroyers. That is why “View Individual Discs” will get you more directly to the discs themselves. Knowing disc models is only helpful if you’re curious whether or not a particular model has a limited edition. Some of the most popular searches include “Bottom Stamp”, “Holiday Edition”, “Limited Edition” and of course the Infinite Disc stamps.